Well, hang on a sec, check these lyrics and you tell me. 9/11, right? Has to be. The unanswered voicemail, the American Planes, the hand that takes? 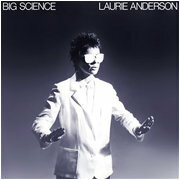 ‘Big Science’, Laurie Anderson first full album (She’d earlier recorded some spoken word with John Giorno and William Burroughs) was originally released in 1982. I wouldn’t call it presience, more Anderson’s uncanny ability to tap the cultural subconscious. Her trademark matter of fact delivery mixes the mundane and the absurd, toying with notions that prey on your mind way in the back, the tapes that never shut completely off. The stuff that jumbled around can be read like tarot cards or chicken entrails, a more accurate reflection of the reader than it is a prediction of the future. ‘Big Science’ is a distillation of her much larger, much longer project, ‘United States Live’, an Opera of sorts of the kind that Phillip Glass and Robert Wilson still make. I never saw the opera, but listened to the 4 disc recording of it once, and I don’t think ‘Big Science’ suffers from shrinkage. Not to say ‘United States’ boring, it isn’t. It’s minimalist holographic in that any chunk you choose to break off is just a smaller version of the whole. “Oh, Superman” touches on all the themes found in the rest of the album and the rest of the opera. I think when listened to in full you do get a greater sense of thematic wash, a more immersive experience if you will, but I’m a fan, and I’m patient. Anderson suffers when taken too reverentially or too seriously, from worshipers and critics alike. I don’t think she intends to be anybodies Zen Master, and I think a lot of fans and haters miss her humor entirely. Anderson is funny, and she means to be. I think that’s funny. How could this guy actually be what she says he is? But of course, she’s talking about the guys’ vibe. And just what is the vibe of a hat check clerk at an ice rink? Who can say? It’s pure poetry. The music will make you think of Eno in early ambient mode, as beguilingly simple as an Erik Sati (arguably the father of minimalist music). It’s haunting, soothing, omnipresent and like Andersons voice, comforting. It’s a perfect juxtaposition to the subject matter. Our worries, our fears, our concerns. I must have played this album a half million times back in the eighties, but it’s too timeless to forcibly link me to any memories the way any music I obsessed over back ten does. It could have been recorded last week or ten years from now or any damn time at all after the invention of the vocoder, an electronic device largely abused by Peter Frampton and Cher. Listen to what can be done with it in the hands of a master. Oh Superman is a very haunting, and beautiful song. I don't see how I could listen to 4 CD's of the same, though.